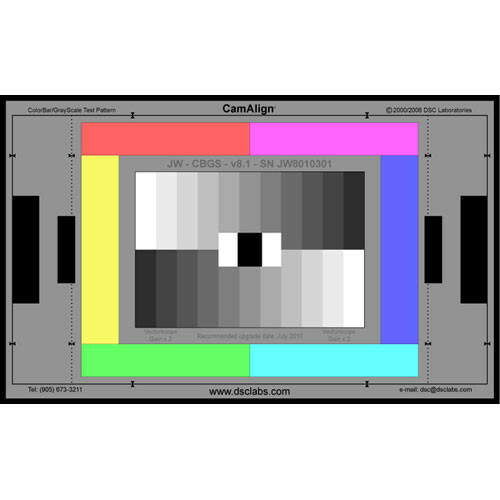 The ColorBar/GrayScale Junior CamAlign Chip Chart from DSC Labs is a chart designed for calibrating the color on your video camera. Many video professionals consider calibration charts a necessity for optimizing camera performance and the production value of images. This chart has been designed with that philosophy in mind and works equally well in engineering or production work. This model includes six vector primary colors, 11-step crossed grayscales, and 100 IRE white and true-black chips. Use this practical and versatile chart to perform color calibration and testing to achieve enhanced results with your video camera. The chart includes a number of options that are equally useful in engineering, production, and post-production work. It features separation between grayscale and color bars. Box Dimensions (LxWxH) 25.5 x 13.5 x 0.9"